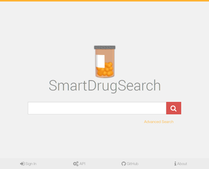 SDS (Smart Drug Search) is an advanced search engine for the screening of up-to-date information on drug-related experimental studies. A small search engine demo indexing articles on antimicrobial peptide research is available at http://​sing.​ei.​uvigo.​es/​sds/​. Moreover, a public REST API is provided, free of any charge, in order to allow external applications to integrate any of the features that SDS provides. The RESTful API enables the use of the searchable collection by different user interfaces whereas text mining tools support domain-specific document labeling, scoring and indexing.